It’s really no secret. We are rather avid Costco shoppers and lovers. Many people as us which we like better – Costco or Sams. We’ve tried both, and the best comparison I have is that Sams reminds me of Wal-Mart, and Costco of Target. Costco’s products seem higher quality, fresher ingredients, and more whole food offerings. Plus, the Costco Brand (Kirkland) is pretty awesome. Bonus points? Costco treats their employees really well. Udi’s Gluten Free Bread (this is an amazing deal – really cheap – but does contain eggs). We buy the loafs and divide them up in the freezer until we’re ready to use them. Almost any spice you could ever need. Ever. Wine. Wine. Wine. So cheap. (12/15/14) Kirkland recently came out with an Eco Friendly laundry and dish washing detergent that are not tested on animals. We bought some of the laundry detergent but haven’t tried it yet. It seems great, though! We always walk through the clothing and household items and often pick stuff up there as we see it. We’ve found hiking poles, tupperware, all-weather car-floor mats and tons of other awesome surprises. I hope this list was helpful! Let me know if there’s anything you get that we’re missing out on! Hi Jennifer! Thanks for stopping by! I live in North Carolina! 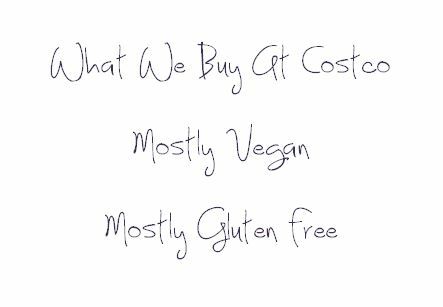 We have been to a lot of different Costco’s and they all seem to carry different things! I wonder if yours would take some requests if you asked! Sometimes we go and they don’t have some of the things – it always seems to be a slight gamble! We always leave with a full cart, though!